St Patrick's C of I Church, in Castletown Kilpatrick, is built on the site of an earlier church that appeared in early 14th century ecclesiastical records. The early church, which was in ruin in 1641, was rebuilt in 1823. The now derelict new church, incorporates some fragments from the old church. The atmosphere seemed quite eerie as we approached the abandoned church, but this feeling soon disappeared when we spotted the stunning early christian slab, pictured right. The metre high slab is facing the west end of the church. It bears a slender latin cross within a moulded frame. In the top two quarters, between the frame and the cross, are fret patterns. The pedimented doorway, double and single ogee-headed windows of the tower, plus the carved stone head, on the wall next to the doorway, are all fragments from the medieval church. Also incorporated into the rebuild are two fragments of a tomb chest, see images below. The 15th century effigy of a woman, pictured above left, is built into the west gable of the church, she is wearing a turret head-dress, in typical Meath style, and a pleated skirt. It is believed to be part of a double tomb effigy. The two central figures are said to represent, St Catherine, wearing a crown, and St Peter, holding a key. These are probably tomb weepers from the same chest-tomb as the female figure. 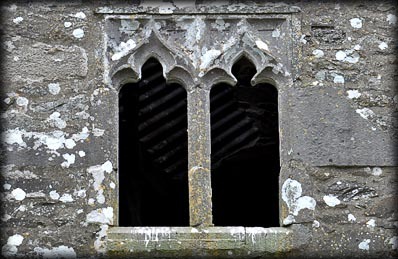 Pictured on the right is the medieval head, and below is the double ogee-headed window. 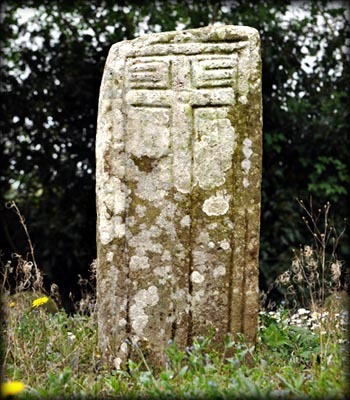 There a number of interesting cross inscribed gravestones scattered around the graveyard. Situated: From Nobber head south on the R162, after 4.6 kilometres turn left onto Castletown Court. Then take the first left. The church is at the end of this road. Discovery Map 35. N 8471 8267. Last visit Apr 2017.